WinAVI Video Converter is easy to use and powerful for experts. Just one click to convert with beautiful user interface. Burning VCD/SVCD/DVD is supported. 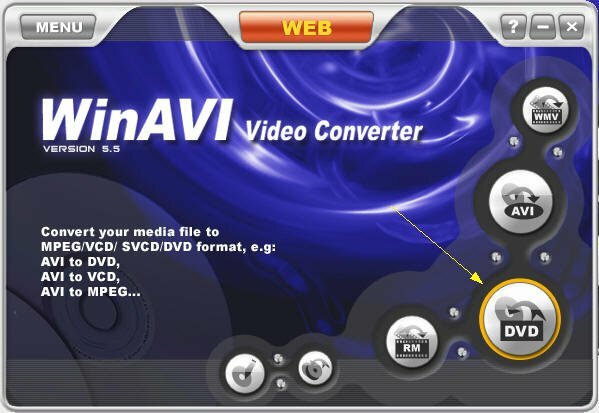 WinAVI Video Converter supports almost all video file formats, include AVI, MPEG/MPG 1/2/4, VCD/SVCD/DVD, DivX, ASF, WMV, RM, QuickTime MOV MP4, and Flash SWF. And it has a powerful video decompress/compress engine that convert whole AVI movie to DVD in 15 minutes. It is a complete solution. Pentium II 233 PC or higher, 32MB RAM or more. ...... VCD/SVCD/DVD, DivX, ASF, WMV, RM, QuickTime MOV MP4, and Flash SWF. And it has a powerful video decompress/compress engine that convert whole AVI movie to DVD in 15 minutes. 1.WinAVI Video Converter can convert avi to DVD/VCD/MPEG/MPG. 2.WinAVI Video Converter support Flash SWF conversion. 3.WinAVI Video Converter can convert all formats to MPEG1/2, VCD, SVCD, and DVD and burn to VCD, SVCD, or DVD disc. 6.Real DVD Navigator encoder included. 7.DirectAC3 technology supports AC3 5.1, which is state of the art technology. It is up to 20% faster with AVI files including AC3 audio. 8.Real Dolby AC3 audio encoder included. 10.Stunning video and audio quality. 11.User-friendly interface that is easy to use. 12.Has the option to preview the video in real-time. Give your converted files both high quality video and Dolby AC3 5.1 audio! Qweas is providing links to WinAVI Video Converter 11.5.1 as a courtesy, and makes no representations regarding WinAVI Video Converter or any other applications or any information related thereto. Any questions, complaints or claims regarding this application WinAVI Video Converter 11.5.1 must be directed to the appropriate software vendor. You may click the publisher link of WinAVI Video Converter on the top of this page to get more details about the vendor.